Nominated in Two Grammy Categories! Probably the most beautiful physical package since Charley Patton's Screamin' and Hollerin' the Blues... magnificently designed.... There's nothing quite like it on earth and possibly in heaven. When we started this project, the producer Lance Ledbetter had already found a company to do the packaging, Woodpak Industries, that had traditionally done packaging for wine bottles. 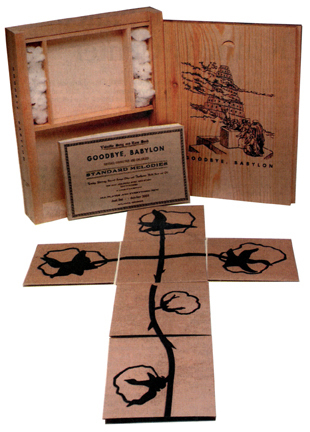 He wanted to use a wooden box, and build compartments into it for the cds, some pieces of raw cotton, and a large book (see above). Each piece is inherently unique because of the knots and natural colorings of the planked cedar. I believe he should have numbered them, because Lance and his fiancee April touched every box, assembling all of the pieces in their shop in midtown Atlanta. 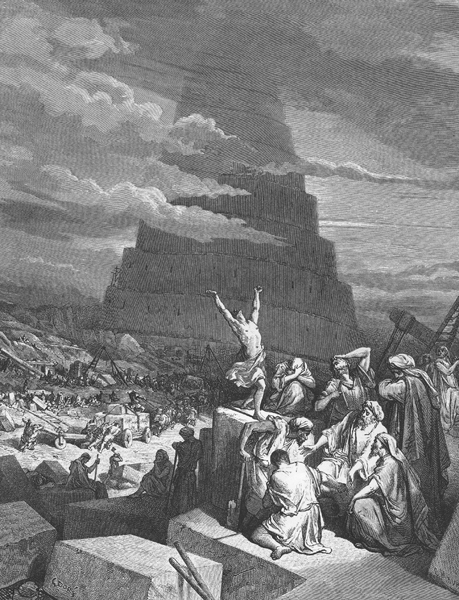 Lance decided he wanted to use Gustave Dore's "The Confusion of Tongues" (1897) as the image for the box cover. My favorite artist Potsy Duncan and I stripped the complex etching down to a simple line drawing for silkscreening on the wooden lid. The wonderful thing about it is that everyone thinks it's burned on, which is a great idea, but impossible with a tight budget. The overarching theme for the Gospel was to be King Cotton. Lance wrote that cotton was to be a 'reminder of the struggle, strife, and sorrow' that so many of the artists included in the set had suffered. This was the part of my work that took the longest to complete. We went round and round with different images of cotton, how to use borders and icons, etc. I finally found stock photos of cotton on the plant, and made outlines of the shapes in Illustrator. I thought it rather primitive and illustrator-ish but Lance showed his mother and she thought the bolls were just beautiful. Many people say it looks like a wood cut or burn, similar to the cover. So I got lucky (blessed?) on that count. Once we established the icons, everything fell into place easily. There are six cds and each cd covers a different gospel theme. There is an Introduction/Overview, then Deliverance Will Come, Judgment, Salvation, Goodbye Babylon, and the Sermons. We used the the six different cotton bolls for each section head, and corresponding discs and sleeves. Another directive for me was that Lance wanted the book itself to look like a traditional hymnal, wider than tall. 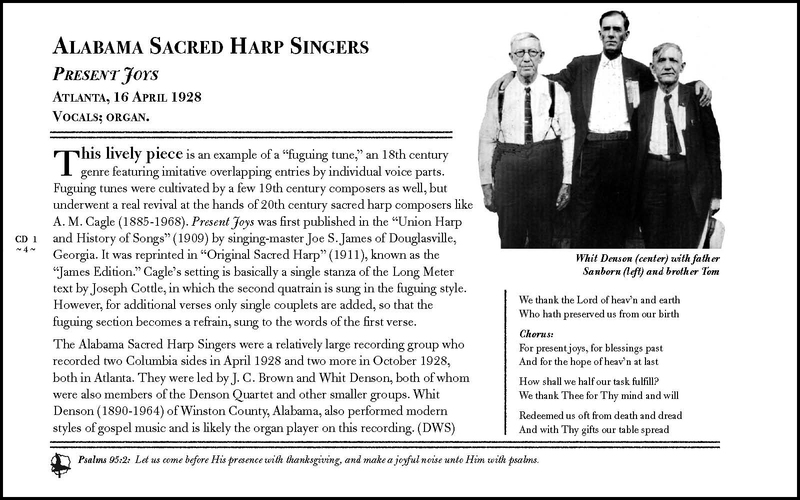 We scanned a really old sacred harp hymnal cover and added the information that we needed for our release. The pages of the book had to contain a lot of information. Lance decided he wanted to included the discographical information; a photo of the artist or some sort of illustration, whether the record label or the musical instruments; facts and incidentals of the song, songwriters, and origins; the song's lyrics (I helped figure some of them out); and a bible verse that Lance's father picked out for each song. There was at least a page per song - we ended up with 200 pages for 160 tracks, 135 songs and 25 sermons. Click the page image below to go to a bigger view. There are 9 more sample pages you can view. Personal Notes: In my humble opinion, if you have a passion for popular music and its diverse roots, there is no more accessible overview of early 20th century music than this set (other than Harry Smith's Anthologies of American Folk Music, which you probably already own). You do not need to be a God-fearing evangelical to appreciate this work. Chances are, if you grew up in any kind of church environment, you already know some of these tunes. The rhythms and passions of the musicians (whether for God or Money) will tingle your spine and make the hair stand up on the back of your neck. You can feel this music right through to your bones. I just can't say enough about this set. Get on over to Dust-Digital.com and buy it, it's worth every penny.